Maverick luthier James Trussart is keen on steel - it's the primary material used in his guitars' bodies, as seen on his most popular creation, the Steelcaster. "Many models go through a process that Trussart player Billy Gibbons calls the 'Rust-O-Matic' technique"
Born in France, Trussart began his career in music as a Cajun fiddler in the late 70s, but soon developed a taste for guitar building. His first steel axes were completed in the mid-80s, including the Steelcaster, as he opened a guitar-repair shop in Paris. 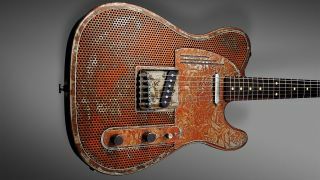 Many models go through a process that Trussart player Billy Gibbons calls the 'Rust-O-Matic' technique - the guitar body is left to corrode in the great outdoors, before being sanded and finished. The steel doesn't just affect the way Trussart's guitars look; their construction gives them more zing than a traditional T-type, with an almost resonator-esque tone. Trussart now builds all his steel-bodied creations in Southern California, at close proximity to his rock-star fans, including James Hetfield, Tom Morello and Joe Perry, who all have a feel for steel. After years of experimentation, James Trussart builds the first Steelcaster. Trussart opens a guitar-repair shop in Paris and continues to build new instruments. Trussart moves his guitar workshop to Southern California. A baritone incarnation of the Steelcaster is introduced.